The kidneys are one of the excretion organs that are shaped like nuts and number two and are located in the lower back, precisely the place below the rib cage on each side of the body. Filter waste and toxins in the blood (including chemicals, drugs, and food). Maintain a balance of salt, mineral, fluid and blood acid levels. Produce active compounds from vitamin D to keep up bone health. Produces erythropoetin, a hormone that functions in the formation of red blood cells. When work or function of the kidney organ is disrupted, filtering and expulsion of waste substances or toxic substances from the body will also be hampered, automatically the waste and toxins will accumulate and accumulate in the body. In addition, disorders of kidney function can also be triggered by other things such as diabetes and high blood pressure. Now this means someone who has diabetes and / or hypertension, the risk of developing kidney disease will also increase. Kidney stones occur because the content of salt and minerals in the urine which should be filtered and released by the body actually accumulates and hardens. The salt and minerals that accumulate will crystallize and form kidney stones. This happens because the body lacks fluids so the urine becomes too concentrated which results in salt and minerals being able to quickly crystallize before being released. Infection of the kidney organs is caused by bacteria because of an infection of the bladder tract, the bacteria spread and rise towards the kidney which will eventually infect the kidney organs. Polycystic kidney is a hereditary disease in the form of a group of fluid-filled bags (cysts) that appear in the kidney organs. These polycystic kidneys besides appearing in the kidneys can also appear in the liver and other internal organs. Kidney failure is a condition where suddenly the kidney organs cannot function or work. If this condition is not treated immediately it will make salt and chemical waste in the body accumulate and then affect other organ system functions. Chronic kidney disease is more severe kidney failure, this is because kidney function continues to decline for 3 months. Chronic kidney disease has symptoms such as fatigue, tightness, and nausea. Initially these conditions and symptoms will not be felt by someone because they are still in stages 1-3, and in the next stage or in the advanced stage the patient will immediately feel it. 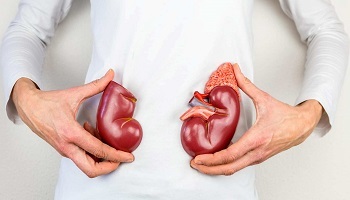 Symptoms caused by kidney disease depend on the type of kidney disease suffered. Urine volume and frequency of urination are reduced. Urine is foamy and mixed with blood. Fatigue, dehydration and shortness of breath. The skin is dry and itchy. Muscle cramps in the legs. In patients with kidney infections and kidney stones can cause fever and chills. Impaired kidney function will cause accumulation of waste and toxins in the blood and will continue to flow throughout the body along with blood flow. This causes bad breath and bad breath to become unpleasant. There are a number of confessions of patients with kidney disorders stating that they cannot feel the taste of food including foods made from processed meat. Nausea and vomiting are one of the effects of the amount of waste and toxins that accumulate in the body. Nausea and vomiting will also cause other effects such as decreased appetite, if left unchecked and then not overcome, in the long run can cause a decrease in body weight drastically. The kidneys function to wash the blood by filtering waste and toxins in it, besides that the kidneys also function as a balancer of fluids in the body. If kidney function is impaired or problematic it will affect skin health due to lack of nutrients, minerals and fluids. One sign is that the skin has a rash and itching, this is the most common symptom of kidney disease. As previously explained, the kidneys function to regulate fluid balance in the body. If the kidney function is disturbed, there will be several parts of the body that will experience swelling due to excess fluid. Body parts that usually experience swelling due to impaired kidney function are the face, hands and feet. Maybe this is the most accurate indicator to show that there has been a problem / damage to the kidney organ. People who have kidney problems will release urine that is dark, concentrated, foaming or even mixed with blood. If this happens to you immediately check your kidney condition before getting worse and chronic. If urine has albumin, then it can be ascertained that the kidneys have problems, albumin is a type of protein that is only present in the blood. If there is albumin in the urine, it means the urine has mixed with blood. The kidneys function to remove creatinine from the blood, if there is a high level of creatinine in the blood, this indicates that the kidneys are having problems. Creatinine is a substance that comes from muscle tissue. CT scans and kidney ultrasound aim to find out whether there are kidney stones, polycystics and urinary tract infections. In general, people will go to the hospital and go to the doctor to treat kidney disease, then prescribed some medication from the doctor to cure it. Even those who experience kidney failure have to do dialysis for a certain period, besides that the costs needed for dialysis are also very expensive. Surely you have often heard, many people say that to overcome kidney problems is to increase drinking water. According to the world of medical therapy white water to cure kidney disease is less likely. More precisely, white water is able to prevent damage to the kidney organs, the need for adequate body fluids can easily dissolve waste and toxins in the body. This means that water is able to support the kidney's working system in properly expressing waste and toxins in the body so that the kidneys work lightly and are not burdened. Water can reduce the risk of kidney disease, and the health of kidney organs can be maintained properly. Consuming garlic can help the healing process of kidney disease, but not recommended to consume raw garlic with large portions. It is better to consume garlic naturally, such as mixing it as a spice or sauteed slice. No need to consume excess garlic, quite a bit but routine every day. Soursop leaves can also help keep up the health of your kidneys, the way is almost the same as the steps above. Drink 1 cup of soursop leaves water 2-3 times a day, this will help to nourish the kidney organs. Binahong leaves are already very well known to be used to treat various diseases. The price is quite expensive, especially for binahong leaves which have been dried and ready for consumption, but when compared with the benefits that will be obtained for the price, it will not be a problem. The trick is that you can boil some fresh binahong leaves, wait for them to boil and drink the boiled water of the binahong leaves while warm. Drink 1 cup of the herb at least 3 times a day before eating. In addition to fresh binahong leaves you can also use dried binahong leaves to be brewed using 1 cup of warm water. Drinking boiled leaves breadfruit leaves are able to improve the working function of the kidneys, this is because breadfruit leaves contain flavanoid chemical compounds, tannins, riboflavin, acicicolin and hydroxyic acid. Submitted research content on the breadfruit leaves is able to restore kidney disease. The trick is to boil some breadfruit leaves, wait until the water is really boiling and the leaves are crushed (can be boiled while stirring). Then wait until it's cold then strain and just take the water, drink at least 2 times a day that is in the morning when you wake up and at night before going to bed. Olive oil has many benefits for body health, including maintaining healthy kidney organs. Olive oil is rich in antioxidants, as we know that antioxidants are useful for counteracting free radicals and toxins that enter the body. The body that has lots of toxins will make the kidneys work harder, with the presence of these antioxidants able to relieve the kidneys by helping to overcome free radicals and toxins that enter your body. In addition olive oil also has polyphenol compounds and oleic acid which can prevent inflammation (anti-inflammatory) which may occur in the kidney organs. Not only is it healthy for the kidneys, olive oil can also prevent cancer and heart disease. Eat olive oil at least 1 tablespoon every day. Apples contain fiber and are rich in vitamins, consuming 1 apple every day can prevent you from getting cancer, heart disease, lowering cholesterol, preventing constipation and of course can treat kidney conditions that are less healthy. Eat apples and skin, because apple skin also has a lot of nutrients. Cabbage has many nutrients and vitamins such as vitamin B6, vitamin C, vitamin K, folic acid and high phytochemical content. This phytochemical substance can nourish the kidneys, maintain heart health, and fight cancer, almost the same as antioxidants, phytochemicals are able to protect the body from various kinds of free radicals. As explained above, water can help and relieve kidney work. Drinking enough water can make waste and toxins in the body easily dissolved which will then be secreted out of the body. Health experts strongly recommend to increase consumption of water so that kidney function is not disturbed. Maybe there are some people who often underestimate urination and prefer to hold it for a while, it turns out this habit will adversely affect kidney health. By holding back the pressure will increase the pressure of urine on the kidneys which can cause kidney failure. Not only that, holding urine means also giving an opportunity to mineral salts and toxic wastes to settle and crystallize which will eventually lead to kidney stones. Not only is it dangerous for the kidneys, junk food is also high in saturated fat and calories which can trigger heart disease and cause obesity. You can read the article about the dangers of junk food here. Tea and coffee that are consumed excessively can damage the kidney condition, both of these drinks contain caffeine which can make blood pressure rise. Now with the rise in blood pressure it can also put pressure on the working function of the kidneys in filtering blood. For that, as much as possible you can avoid excessive consumption of tea or coffee. Undeniably, sleep is the best way to rest the body and its internal organs. When sleeping the body will regenerate damaged cells and tissues, this means the body is healing naturally. With enough sleep at least 6-8 hours at night can reconstruct the organs in the body that have problems, including the kidneys. A high amount of salt or sodium in the body can overload the kidneys because of increased blood pressure. It has been explained above that hypertension can damage kidney organs, and you need to know, in normal conditions in all parts of the body blood pressure is lower than the blood pressure in the kidneys. Imagine if you have hypertension or high blood pressure? Of course the blood pressure in the kidneys will also be higher. This makes the kidneys become burdened and long periods of damage will damage the kidney organs themselves. That is an explanation of kidney disease, causes, symptoms and how to treat kidney disease naturally without having to dialysis.